Yarmolenko – Cutting ties to make room for something new? While the World Cup in Russia is heading towards its final phase club teams across Europe are starting their preparations for the new season. For Borussia Dortmund, this means a new beginning under new head coach Lucien Favre and a restructuring of a squad that failed to meet expectations last season. One player that will not be part of the rebuild is the Ukrainian forward Andriy Yarmolenko. Brought in last summer to replace Ousmane Dembélé Yarmolenko never really had a chance to settle in Germany. The Ukrainian forward played just 26 games, in three competitions, and scored six goals and six assists. In the Bundesliga, Yarmolenko managed 18 appearances in which he scored three goals and provided five assists. The Ukrainian missed most of the second half of the season with a persistent tendon injury. Hence, after matchday 20 Yarmolenko just managed 27 minutes spread over two games for the Yellow and Blacks. Despite the injury, however, there were some glorious moments. The goal in the Champions League against Tottenham, in particular, stands out. Overall, however, Yarmolenko was brought in to replace Dembélé. It was a task that was almost impossible to complete, not because Yarmolenko does not have quality but because the two were two completely different players. For that reason, there was always a sense that the 28-year-old failed to meet expectations – even though his numbers were not particularly bad. Another factor has been that the Ukrainian never got fully integrated into a side that was mostly pre-occupied with self-destruction. Replacing a player, who striked his way to Barcelona, Yarmolenko entered a dressing room where another star, Pierre-Emerick Aubameyang, was also trying to force a move away from the club. Aubameyang’s antics, in particular, made it difficult for the side to find any chemistry last season. As Dortmund struggled through last season, going through two coaches to more or less stumble into a Champions League, the club bosses realised that a rebuild was necessary. For that rebuild the squad had to be made smaller and some players to be sold to free up resources to bring in key players – such as a new striker. Hence, when an offer from West Ham United arrived that more or less covered the transfer sum that Dortmund paid one year ago, both Dortmund and Yarmolenko were all ears. Dortmund will receive €20 million, €5 million less than what they paid a year ago. With BVB having several players that can play on the wing Dortmund can now use the cash to invest in other key areas. The prime area remains to find a forward – a position that has proven difficult to fill. The quick separation also indicates that new head coach Favre was not necessarily a fan of Yarmolenko’s style. The Ukrainian is a powerful winger but at times is limited by the fact that he relies on just his strong left-foot. It is a deficit that comes from Yarmolenko playing too long in the weaker Ukrainian Premier League, and it will be interesting to see how he will cope with that deficit in England. One asset that he brings to the table, however, is power. Yarmolenko is tall and robust powerful winger, who uses his athleticism to break through defensive lines. It is the sort of power football that could work well at a club like West Ham United. Heading to England, away from Dortmund, could be the best move for a forward who in essence has lost an entire season in Germany. In fact, this transfer is a win-win situation. Yarmolenko gets a new beginning, and a payday in the prestigious English Premier League and Dortmund get another cash injection that now will have to be used to bring in a forward that perfectly fits Favre’s style of football. Hello, Manuel. Do you think Yarmolenko is similar to Marko Arnautovic? In my opinion, there are plenty of football players that moved from Germany to BPL that had registered a great evolution, such Shaqiri, Arnautovic. 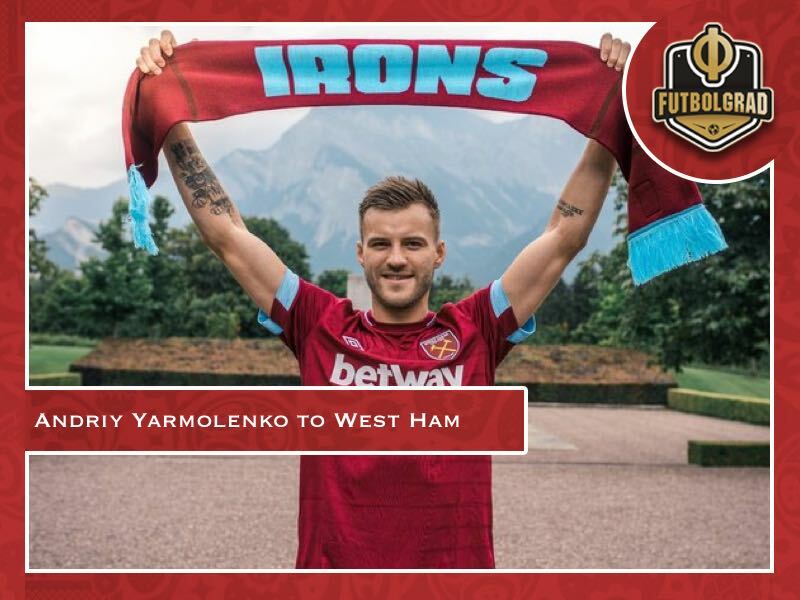 I think Yarmolenko will fit in at West Ham. Dear João. You make an interesting point and I was thinking about Shaqiri when I wrote this. But Shaqiri, of course, threw his opportunity in Germany away after not having the patience to await his time at Bayern. As for Arnautovic that might be an even better comparison. Power forwards like him might fit the Premier League a little bit better. Power-forwards are more appreciated in England and their physical play is more tolerated by referees. As for Yarmolenko, we will have to see how he gets on at West Ham. I reckon Dortmund did not let him go because he was a bad player but rather as he was an asset they could cash in on without losing squad depth.